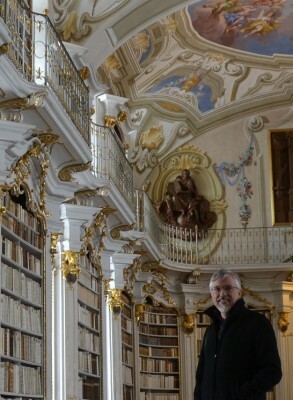 Professor James W. Watts in the baroque library of Admont monastery in Austria. A fellowship funded by Germany’s Ministry for Education and Research has allowed religion professor James W. Watts to apply his work on the Syracuse University-based Iconic Books Project to a broader study of the interaction of religion and the senses. Watts is completing a year as a Käte Hamburg Kolleg visiting fellow at Ruhr University in Bochum, Germany. He is part of an international research group at the Center for Religious Studies (CERES). Watts, an expert in the Hebrew Bible and ancient Near Eastern textual traditions and former chair of Syracuse’s Department of Religion, founded the Iconic Books Project in 2001. The project catalogs and describes the symbolic or “iconic” uses of books and other texts. The idea, Watts explains, is that books themselves are considered valuable separate from the words and ideas they contain. Examples include a Catholic priest kissing the Gospel, or, in the Jewish tradition, rules that govern how to handle the Torah. Secular examples include the respect afforded Shakespeare’s folios or the U.S. Constitution. Watts will host “Seeing, Touching, Holding, and Tasting Sacred Texts,” on April 7 and 8. The international symposium he organized will feature scholars from Germany, Sweden, Denmark, Spain, Korea and the United States. Watts will present “Scripture’s Iconic Touch” at the symposium. Watts has been surprised at the prevalence and consistency of ritual uses of books across traditions and time periods. Art from Ancient Egypt, Greece, and Rome, for example, depicts people displaying scrolls the same way a rabbi holds up the Torah—as a demonstration of the book’s importance. In addition to the history of biblical interpretation, his book will also cite ritual and performative uses to explain how the Torah and Bible became important to Judaism and Christianity. “It turns out that seeing, hearing and touching the books in rituals has played a large role in establishing and maintaining scripture’s influence,” he explains. Watts late last year presented research papers on iconic books and texts and on performing and translating scriptures. He will also lecture April 22 at Trinity College, Dublin, Ireland; May 12 at the University of Zurich, Switzerland; and May 26 at the University of Lausanne, Switzerland, before returning to Syracuse to teach in the fall.